Welcome to the OKI Vacation Vittles market! Vacation Vittles sells beach vacationers at Oak Island one or more produce bags filled with local food grown and harvested by farmers located in Brunswick, Columbus, and Bladen Counties, North Carolina. Youth ambassadors at Men and Women United for Youth and Families, CDC will fill the Vacation Vittles Produce Bags and deliver them on Saturday of each week. To pick up your Vacation Vittles bag(s), go to your realty company’s office, either Oak Island Accommodations or Margaret Rudd and Associates in Oak Island. Each Vacation Vittles Produce Bag will be filled with a variety of produce picked at the peak of freshness by area farmers, then packed and delivered for easy customer pickup the day they arrive in Oak Island. Each bag will contain enough fresh produce to feed a family of four at least three servings of fruit and vegetables for the week. At this time we only offer pick-up for Saturday arrivals. Each customer vacationing in Oak Island during the month of June may order one or more bags of produce. Each customer vacationing in Oak Island during the month of July may order one or more bags of produce. 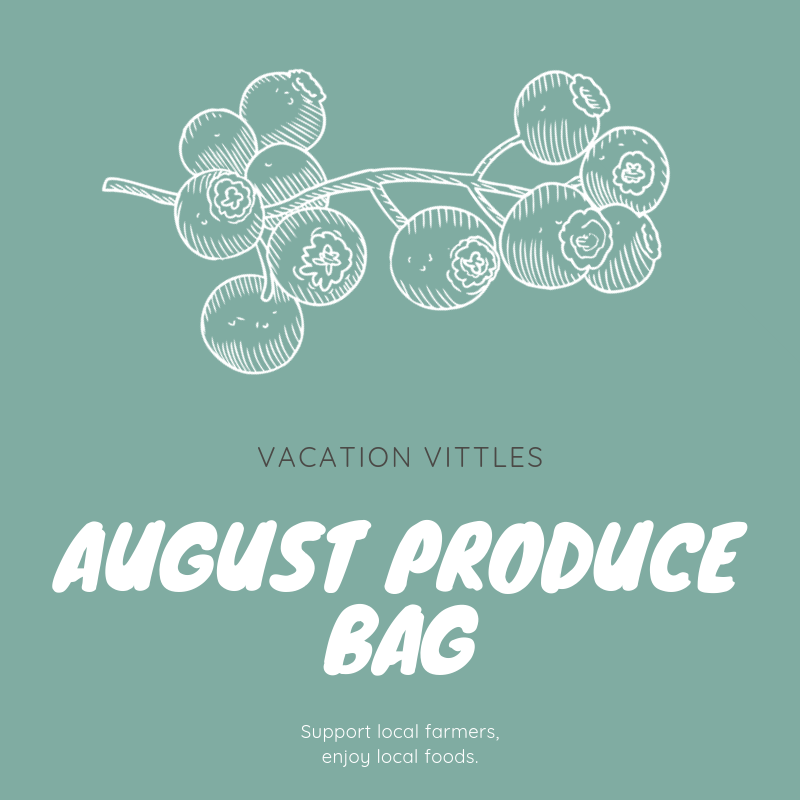 In August, the Vacation Vittles Produce Bag will contain enough fresh produce to feed a family of four at least three servings of fruit and vegetables for the week. Listed below are the types of fruit and vegetables typically included in an August produce bag; however, the actual contents of your bag will vary depending on each week’s harvest. Each customer vacationing in Oak Island during the month of August may order one or more bags of produce. Vacationer Supported Agriculture is an initiative of the Fork to Farmer project. Funding for Fork to Farmer was made possible by the United States Department of Agriculture’s (USDA) Agricultural Marketing Service through grant AM170100XXXXG110. Its contents are solely the responsibility of the authors and do not necessarily represent the official views of the USDA.